Distinguish any workspace with the charming style of this Leonard energy-efficient LED table lamp. This Leonard energy-efficient LED table lamp by Lite Source features a walnut finish, which boasts elegant richness and warmth. The lovely fabric shade is the right fit to enhance and complete the refined style of this table lamp. The nightlight feature proves to be useful wherever this table lamp is placed. 24 1/2" high. 13 1/2" high from base to bottom of shade. Integrated 6 watt LED module; light output of 480 lumens, comparable to a 40 watt incandescent bulb; 3000K color temperature. 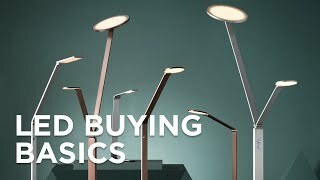 Leonard energy-efficient LED table lamp with night light by Lite Source. Walnut finish; wood and metal construction. Modern design at a reasonable price. What is the width and depth of the shade? BEST ANSWER: Hi - The lamp shade measures (17.5"W x 9.5"D) Top x (17.5"W x 9.5"D) Bottom x 11"H.
Modern and yet styled with softening accentsthis chrome finish metal LED table lamp works in any space.